Aikatsu! – 80 | Mezashite! Thank you, Sakura, for another impossible to translate pun. I hope none of you are linguists. Also, enjoy your parallels between the fifth episode of this cour and the fifth episode of the first season. This entry was posted in Aika2! by Akatsukin. Bookmark the permalink. I don’t think linguists would mind. Linguists aren’t like that. 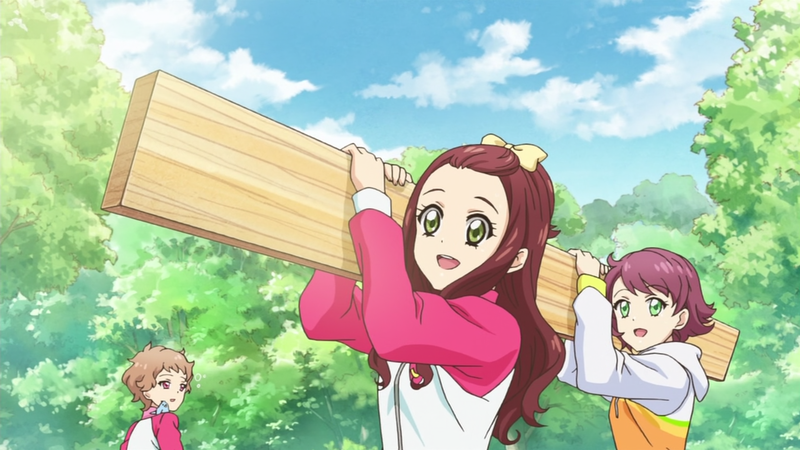 Those episodes with Akari somehow makes me remember of Ichigo when she was starting aside from the fact of Akari not having any talent but it’s kinda refreshing to see a character starting from the ground again. Thanks, good episode, and personally I applaud your handling of that pun. I feel this show is promoting bad safety practices when it comes to woodworking! No safety classes or gloves while working around saws! Truly reprehensible!